Have I ever told you that I used to work at Starbucks? It was only for a hot minute – thank GOODNESS. A few years back I picked up a second job working at Starbucks to save a little extra cash. For 5 months I got up almost everyday at 3:30AM to be ready for my shift. I’d work about 5-6 hours there before clocking out and heading to my actual full time job. I get tired just thinking about that time. I learned a lot about people working there – some good, some bad, and some totally useless but mildly interesting. One thing I learned is that people go absolutely mental over their cranberry bliss bars – cranberry bliss bars and red holiday cups actually. We had to wait until the day after Thanksgiving to start selling them and they disappeared just about as quickly as we put them out. 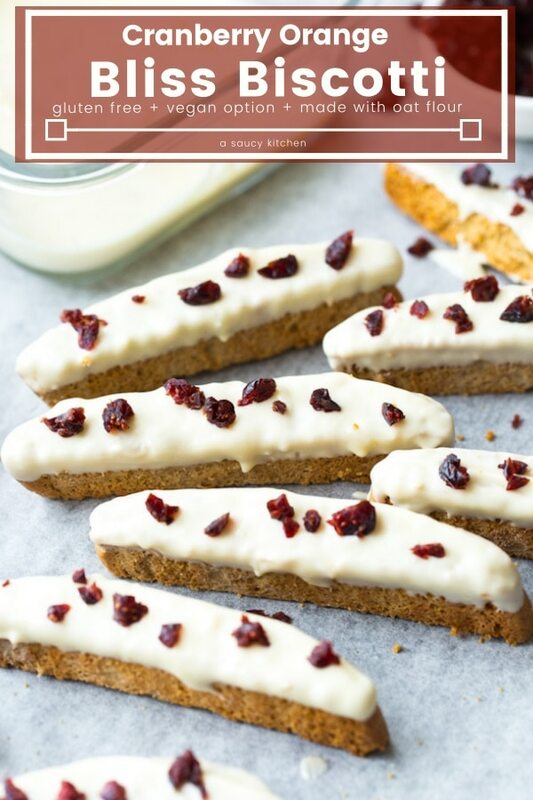 Biscotti means ‘twice baked’ and it’s exactly as it sounds here. 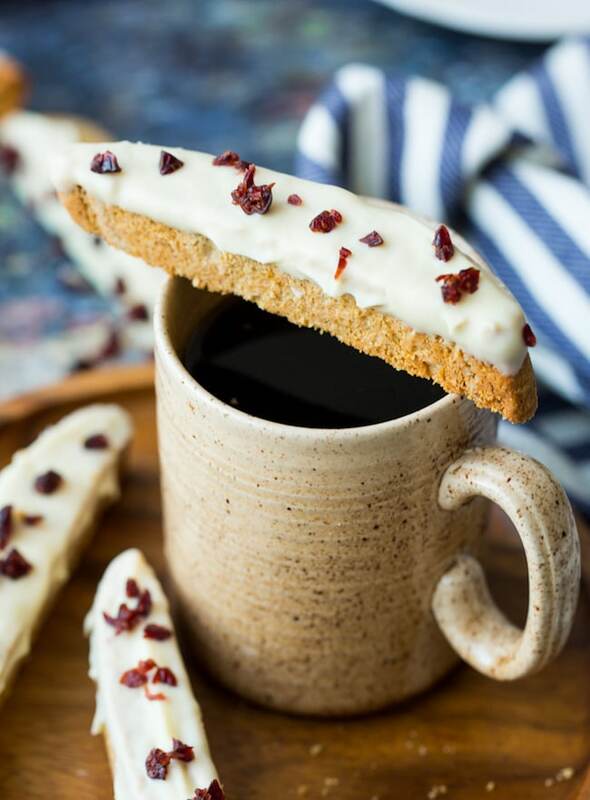 The signature log shape and the double baking (which makes for an extra crispy cookie) makes it perfect for dipping into cups of coffee. Despite needing to be baked twice for the classic cookie crunch that makes biscotti unique – it’s fairly easy to make once you break it down. I’ve tried this recipe a couple of times using flax eggs to see how it would come out for my egg free friends. This recipe really works best with real eggs if you can use them, but you can sub with flax eggs if you need to. Just be aware that the dough won’t spread quite as much while baking and the top of the biscotti log will have a few cracks in them. I also found the slicing bit to be really difficult because the dough was more crumbly, but after the second bake it was exactly as it should be and no longer falling apart. What about the oat flour? I go into more detail in this post here but oat flour is often processed alongside gluten containing grains. If you need to make this gluten free for yourself or for your gluten free friends please make sure to use certified gluten free oat flour. If you don’t have any oat flour on hand you can make it yourself by grinding up rolled/quick oats in a high powered blender. Yes! Just make sure to use dairy free white chocolate. 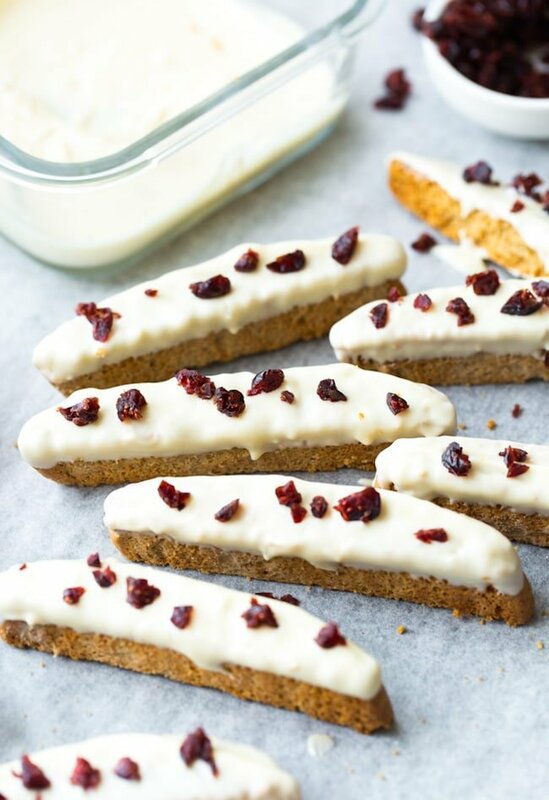 Don’t forget to #asaucykitchen on instagram if you make these cranberry orange gluten free biscotti! I love seeing what you make! You can also post your pictures to our facebook page! 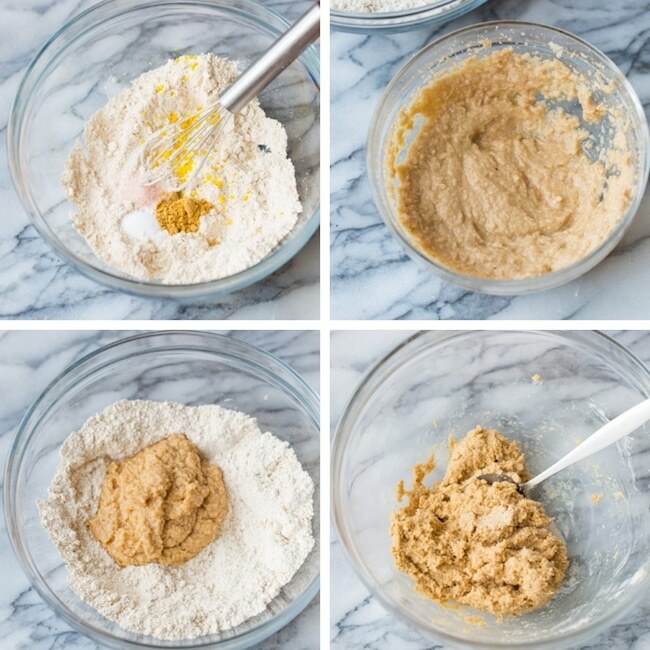 In a large mixing bowl whisk together the oat flour, baking powder, ginger and orange zest. Set aside. In a medium sized mixing bowl use an electric mixer to beat together the sugar and coconut oil. Scrape down the sides as need. Add the vanilla extract and egg until creamy and full combined. Add the egg mixture the oat flour mixture and mix together until combined and a dough forms. Once fully mixed cover the dough with plastic wrap and refrigerate for at least 20 minutes so that the dough becomes less sticky and easier to handle. Preheat the oven to 325°F/160°C while the dough is chilling. After refrigerating, roll the dough out on a lightly floured sheet of baking parchment and form a 12 inch by 3 inch log that's about 1/2 inch thick. Transfer the baking parchment with the dough log to a baking sheet and bake in the oven for 20-25 minutes or until the edges start to turn a light golden brown. Remove the log from the oven and let cool for at least 10 minutes on the baking sheet. Once cool enough to handle, use a serrated to slice the log into 1 inch slices. 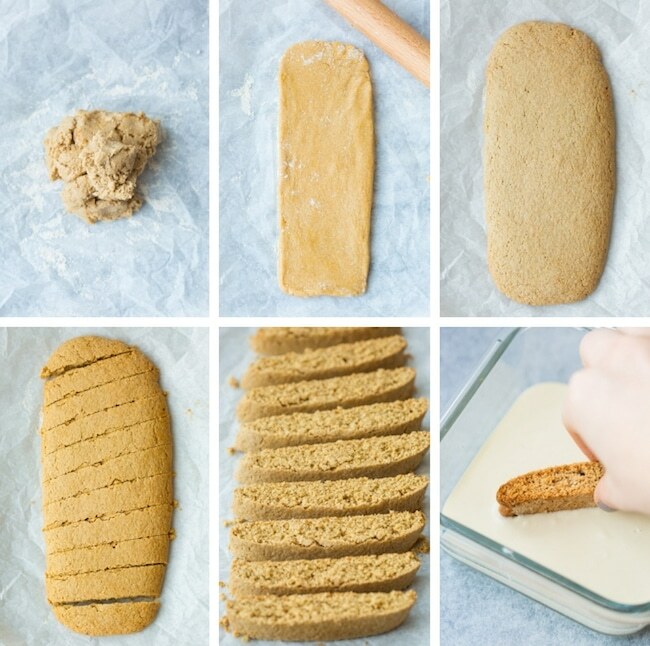 Lay the biscotti cut side up and return to the oven for another 12-14 minutes. Remove from the oven and let cool. Dip one long side of the biscotti in white chocolate. Lay out on a large sheet of baking paper, chocolate side up. Sprinkle the chopped cranberries over the chocolate and let dry. Egg Free Version: I've tried this a couple of times use a flax egg with varied results. There were more cracks in the top of the biscotti and it didn't spread quite as much. It also requires more patience when cutting the biscotti into slices as it was prone to breaking. After the second bake the cookie was no longer crumbly and tasted just as good. These sound delicious! 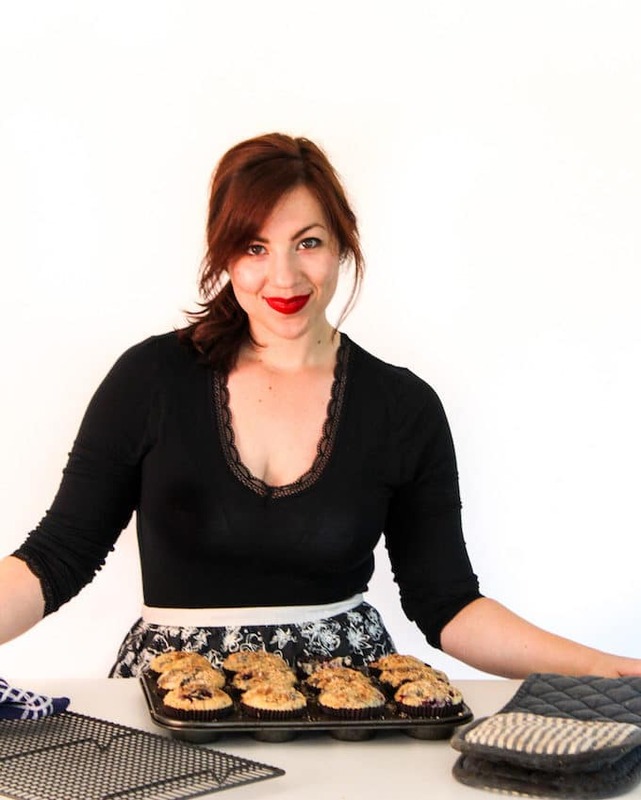 I like your take on cranberry bliss bars – I too worked at the aforementioned coffee conglomerate. Do you use white chocolate chips, or bars? I make cranberry bliss bars, and have learned that melting white chocolate so it can be drizzled is tough. I buy only the really nice organic white chocolate bars (that don’t have all the gunk added to them), and melt it double-boiler style. Do you have any tips for melting the white chocolate for these? It looks like you melted it in a glass baking dish, I’m guessing maybe in the microwave? I suppose if it gets a little clumpy, that’s not as big of a deal as with the bliss bars, because you’re dipping them in it, and it doesn’t need to be drizzled. Thanks! I totally know what you mean about melting white chocolate! I’ve used both before but I find white chocolate bars to be easier to manage. I don’t really have any tips other than just babysitting it as it melts. I just pop it in the microwave and melt in 15 second increments and take it out to stir in between each increment. So long as I take it out to stir often enough I don’t usually end up with clumpy chocolate. Hope that helps! Okay, great, thanks for your reply! I’ll stick with the white chocolate bars I usually use. can i substitute coconut oil. if yes what else can i use. I haven’t tried it with other oils yet but I do think any other type of neutral flavoured oil should do! Probably melted butter as well! I made this recipe last night and it turned out beautifully! I was really impressed by the great taste and the fact that it was not crumbly at all. I have a whole bag of cranberries that expire soon and I was looking for ways to use them up. This is definitely a recipe I will keep and make more of! I’m so happy to hear that! Thank you so much for coming back to let me know what you thought! So glad you liked it! Thanks Heidi!